This information will be limited to GM 10 bolt rears, 8.5" and 8.2", with bolt in axles. This should work on 12 bolts as well, the setup I used was from a 1983-87 Camaro. 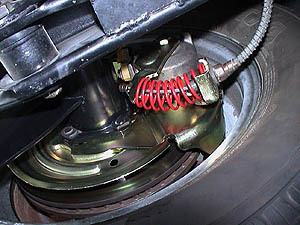 The 1979-80 Firebird with the WS-6 package has 11" rotors. The calipers with this setup rubbed the inside of the stock 15" wheels. If after market wheels were used, or stock wheels with a different offset, they should work. I wanted to retain the stock wheels. The donor cars I looked at were Camaro, Firebird, and Seville. The early disc setups look a little weird, the right caliper is to the rear and the left is to the front. 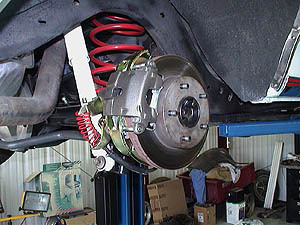 The Camaro rotors and calipers are smaller, 10.5" rotors. 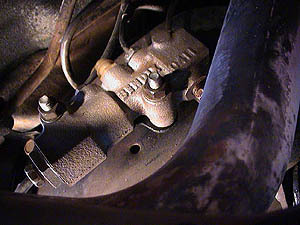 The Seville has a 5 on 5 bolt pattern and two different types of calipers. The backing plates for the Seville and the early WS-6 Firebird are one piece. The later Camaro/Firebird are two piece, a dust shield is spot welded on. The bolt pattern on the Camaro and Firebird are 4 3/4 on 5. Be sure to get the proportioning valve, I used the one from the Seville, closer to same weight. The backing plate for the disc setup is twice as thick as the drum setup. This will cause too much endplay for the axles. A spacer will have to be used to take up the difference in plate thickness. 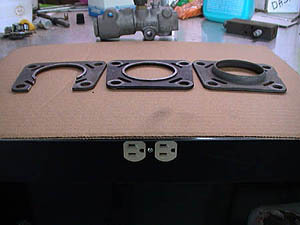 I used an axle retaining plate. The lip of the plate was milled down to .080, see photo, notched to fit over the axle without removing the bearings, and installed backwards. I arrived at that dimension by installing the backing plate and axle and checking the endplay of the axle. Shims can be used behind the bearings for small corrections, but you have to be careful not to push the seal out to far, leaks. Backing plates: The angle of the backing plates will have to be changed. I rotated them up almost 45 degrees. For the right side it was needed so the parking brake assembly would clear the shock. For the left side, to give the parking brake cable a better angle, and symmetry played a part also. I used an extra axle retaining plate for the hole pattern after the angle was determined. 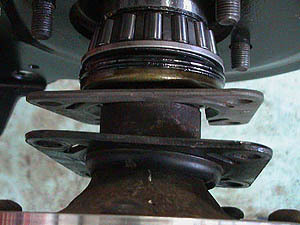 The flange of the axle will have to be turned down to 5.75" to fit inside the rotor. Parking brakes: I used my original on the left side so I would not have to change the length. The right side has a longer housing and cable. I cut the cable so it would meet up with the original coupler and welded a new end on the cable. Lines: I used the original lines. 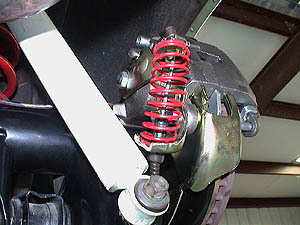 The Seville and early Firebird did not have flex lines. They used a couple of switchbacks to allow for movement of the calipers, this is what I did. The Camaro I pulled the setup off of had a flex line on the right side only. The lines at the proportioning valve are the same size, but the ferrule nuts are different. I cut the old flares off, installed the correct nut and re-flared the lines, (double flare). I mounted the proportioning valve in the same location as the original to keep the line changes to a minimum. I did move it some for header clearance. After all is bolted up, for the last time, adjust the park brake levers, there is an internal ratchet, bleed the system and go driving.